Author Jim West was on hand to sign copies of this exciting new release! Thanks for being there! In the future, under the leadership of America’s first Black President of the United States, the country is at war. The land of the free and home of the brave, must navigate through the dire straits of CIVIL UNREST at home! Lisianna Rockefeller, the wife of a congressman and a popular journalist, becomes enmeshed with a group known as the Consolidated Citizens Corp, commonly known as the CCC, and a man known only as X, who is involved in smuggling people out of Crooked County that are on the list of suspected persons. They will certainly meet with a bad end if not taken to safety. A naturally born leader Lisianna does her best to garner support to once again pursue the AMERICAN DREAM!! She hosts rallies and gives speeches that gain support of the regional radio stations that rally around her, but by that brave and positive action she quickly attains enemies in the power elite that are currently in power in her home state and the United States! South Carolina Secedes… and an Alabama Militia must fight to save the Sweetheart of the South… journalist Lisianna Rockefeller! Jay Wilkes is the commander of the special task force assigned to catch Lisianna who was forced to flee Crooked County. The famed journalist and wife to a well-known congressman and senator’s son, Lisianna Rockefeller was hunted by the Agent of the Devil Jay Wilkes. But Lisianna had a secret friend. Her friend was truly king of his realm. The dark beast that was always watching Lisianna was only a shadow to others. Was the mysterious creature merely a shadow or maybe only a ghost? “This writer could be the next Stephenie Meyer with this fresh and exciting spring release about a young and beautiful journalist Lisianna Rockefeller. She falls in love with the leader of a group dedicated to supporting secession of South Carolina and also involved in forming the NEW United Southern States of America. Lisianna the captivating main character falls in love with the leader of the CCC. His true identity was secret, and he was known only as X. A dark beast, and certainly the ruler of the high mountain realm, the Ghost Wolf was always watching and seemed to always be close to the beautiful Lisianna during the introduction of this intriguing and mysterious character. I felt the relationship between Lisianna and the Ghost Wolf was similar to the Beauty and the Beast! This book is very current, and OBAMA is president of the US, but proving to be NOT skilled at being a Commander and Chief of the United States in a time of war. The beautiful setting, the action and adventure, plus the horror and thriller qualities of this a book will make you want to keep to yourself and not loan it out to your friends, who you know will never bring it back! I loved this book and so will you! I can?t wait for the sequel! Graphic violence and some compromising sexual situations definitely put this book on the border line of being a PG. Most certainly, close to an R rating would be appropriate, but a possible hit in the young adult market. Some strong statements about love are made that includes a very edgy political message! If you are looking for something very fresh and different, that is also well written? Jim West is a career broadcaster who spent the majority of his life in California as a program director and music director at several of California’s most popular radio stations. An entertaining morning host for seven years, West headed east and a gig at WMMS-Cleveland, readers of Rolling Stone magazine voted WMMS as “Radio Station of the Year” nine years in a row! The First Battle of the NEW CIVIL WAR!! Revenge of the Ghost Wolf! …was signed by the author Jim West last September the 12th in Cuyahoga Falls Ohio! Thanks for your participation! Jim West Author of Revenge of the Ghost Wolf, long time California Broadcaster and former WMMS 100.7 "Air Personality"
Here is a review of the latest novel that tells the truth about America! Being a truck driver, I listen to the radio a lot and first got interested in this book when I heard a broadcast on the radio interviewing the author Jim West, who I understand is also a broadcaster which was pretty evident by his voice. I was intrigued by the interview which was more than an hour, discussing the real Ghost Wolf that was witnessed out in the wilderness of a remote area of California. A Navajo Indian Chief from New Mexico was also on the program that night. The Navajo believe this beast to be Supernatural, but Mr West said his impression of it was that it was larger than life and quite real, but made his large, and formerly fearless German Shepherd turn and run when confronted with the beast in the darkness one night after midnight near the secret government base called China Lake. I found the website for the book and wrote to the author and received my signed copy. I really liked the book, and hold precious my quiet reading time. I really related to some of the characters, but especially liked how current the book is. Especially since it also talks about America possibly being invaded by foreign troops, while most of our forces are fighting battles in other countries. Target has about the best price for this book and I am buying another copy because I don’t want to loan out my signed copy. I really liked the action which starts right at the beginning, but especially grew fond of the Ghost Wolf. I understand this is the first of a three part trilogy. I loved the ending, but I can’t give it away. In the future, under the leadership of America’s first Black President of the United States, the country is at war. The land of the free and home of the brave, must navigate through the dire straits of civil unrest at home! South Carolina Secedes… and an Alabama Militia must fight to save the Sweetheart of the South… journalist Lisianna Rockefeller! Click on See All Detailed Ratings(below) to order book! Jay Wilkes is the commander of the special task force assigned to catch Lisianna Rockefeller, who was forced to flee Crooked County. The famed journalist and wife to a well-known congressman and senator’s son, Lisianna Rockefeller was hunted by the Agent of the Devil Jay Wilkes. But Lisianna had a secret friend. Her friend was truly King of his Realm. The dark beast that was always watching Lisianna was only a shadow to others. Was the mysterious creature merely a shadow… or maybe only a ghost? Contact Cosmic Communications for further information or author contact info, or for further publicity information. Tags: A new civil war in America, Glenn Beck, horror-thriller-action-adventure, Hot New Novel, March 09 book releases, NEW CIVIL WAR in the United States! 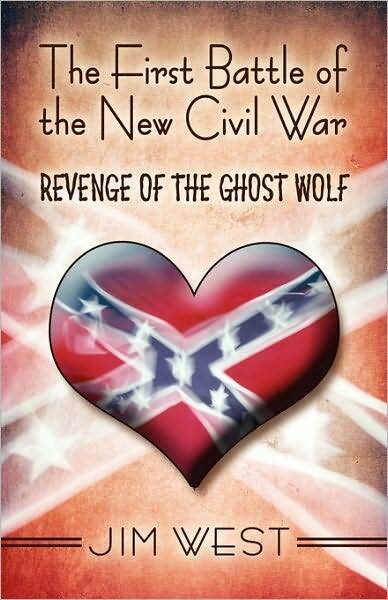 New book by Jim West, New Fiction, Revenge of the Ghost Wolf, Sci Fi, Secession, The First Battle of the NEW CIVIL WAR - Revenge of the Ghost Wolf in hardback and paperback!